"How many planets are there?" People of a certain age will instinctively respond "Nine!" to this question, because between 1930, when Pluto was discovered, and 2006, when it was re-designated a dwarf planet, this was the unequivocally correct answer. That the Earth is one of nine planets orbiting the sun at vast distances from the sun and each other was a fact taught to students worldwide, often as early as elementary school. If you didn't know much else about the solar system, you were still bound to know how many planets there are. Especially curious students endeavored to learn the names of these planets, too, and some details about each. One helpful thing is that when people learn the names of the planets, they usually learn them in order from innermost to outermost, that is, in order of increasing distance from the sun. If you have a hard time recalling the names of the planets in order with no other context, a memorization device called a mnemonic, which often evokes unrelated humorous images to add flavor to the topic at hand, can come in very handy. Many clever planetary mnemonics are already in circulation, but that shouldn't keep you from inventing your own clever mnemonic for planets. What Order Do the Planets Go in From the Sun? Some people can simply memorize this one-line poem of sorts and be done with the exercise, and they do not require a special trick for keeping the solar system order straight in their minds. Others can benefit either from an acronym for planets or from a sentence consisting of eight words whose first letters are the same of the first letters of the planets in order from Mercury to Neptune. Before this is explored, a basic treatment of the solar system as a whole is instructive. The solar system's accepted outer boundary is about 9 billion miles from the sun. The Earth is about 93 million miles from the sun, meaning that the outer reaches of the solar system are almost 100 times as far from the sun as the Earth is. Since light travels at about 186,000 miles per second (186,282 miles per second to be exact), light from the sun takes over 13 hours to reach the outer limits of the solar system. But if 9 billion miles sounds like a great distance, bear in mind that light from the sun takes over four years to reach the next-nearest star. The planets are named after the famous gods of the ancient Greek and Roman cultures. Mercury (Greek god name Hermes) was the messenger god. That the innermost planet was named after a god that had to be swift on foot is no accident, because from the vantage point of Earth, Mercury, with its small orbit (43 million miles from the sun) and consequently short year (88 days), appears to zip back and forth across the sky with great speed compared to the other four visible planets. (Can you guess what those are based on information already provided?) Mercury is only a little larger than the Moon, about one-third Earth's diameter. Venus (Aphrodite) is the hottest planet despite being considerably farther from the sun than Mercury, orbiting the sun at a distance of 67 million miles. It is the nearest planet to Earth and is the brightest in the sky, in part because of its closeness but also because its methane-rich, dense atmosphere traps heat superbly. It is slightly smaller than Earth, but the conditions on its surface are radically different. Earth, which you are likely to remember on your own, is included here for completeness. It orbits the sun at an average distance of 93 million miles. It is a sheer accident of astronomical geometry that the disk of the sun and the disk of the moon appear to be almost exactly the same size in the Earth sky. Mars (Ares) is often called "the Red Planet" for the color that easily distinguishes it from the rest of the planetary herd. At almost 129 million miles from the sun, Mars takes nearly two Earth years to orbit the sun. It is believed to have once held significant amounts of water, a precondition for life, and has been the subject of intense exploration by probes as well as the center of lots of science-fiction tales. Jupiter (Zeus) is the first of the gas giants and by far the largest object in the solar system besides the sun itself, weighing twice as much as the other planets combined. As of mid-2018, 79 moons had been confirmed orbiting the planet famed for the Bright Red Spot in its southern hemisphere. Incredibly, this enormous object 500 million miles from the sun takes only 10 hours to complete a single rotation. Saturn (Cronos) is known for its elegant rings. All of the gas giants have rings, but Saturn's are visible using a decent pair of binoculars when they are not angled directly toward Earth. It is the most distant planet visible to the naked eye, and thus the farthest one known to the ancients. Its rings were discovered in the 1600s by Galileo. Uranus (Caelus), discovered in 1781, takes 84 Earth years to revolve around the sun. It is notable for its 11 small rings, its bluish hue and the fact that its axis of rotation is nearly horizontal, as if it had been knocked over. In fact, some astronomers believe a collision with another large object early in its history is responsible for this tilt. 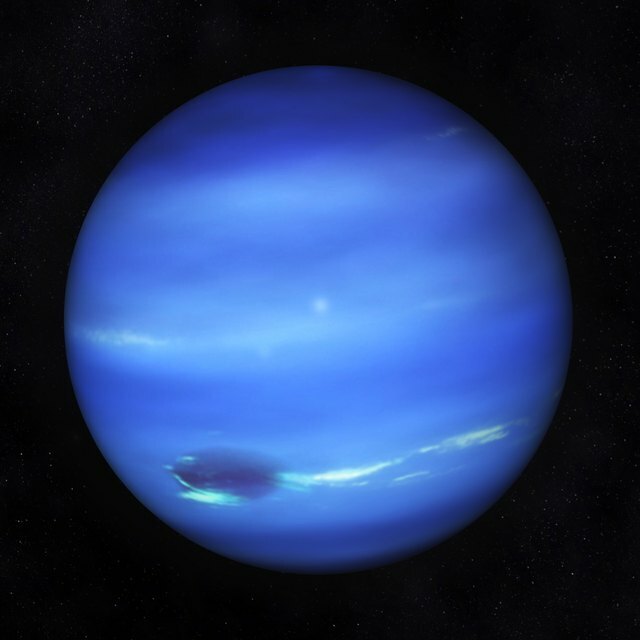 Neptune (Poseidon), though 2.7 billion miles from the sun, is less than a third of the way out to the edge of the solar system. Because Neptune takes 165 Earth years to orbit the sun, it has completed only one revolution around the sun since its discovery in 1811. It is believed to be the windiest of the eight planets. What Is a Mnemonic Device to Remember the Planets? Though a difficult word to spell and pronounce at first, a mnemonic, as noted, is a trick used for recalling information in a list that in isolation may be hard to remember. One such list is the 12 cranial nerves, many of which have long and confusing names. If medical students have a way to remember only the first letters of these nerves, this information can in turn trigger the full name of each nerve, in order. Perhaps the most popular planetary mnemonic is "My Very Educated Mother Just Served Us Noodles." This was adapted from "My Very Educated Mother Just Served Us Nine Pizzas" after Pluto's change of status required an adaptation to this 70-year-old mnemonic. Mike Brown, an astronomy professor at CalTech, came up with "Mean Very Evil Men Just Shortened Up Nature" as a nod to his personal feelings about the Pluto demotion. "My Very Educated Mother, Crying, Just Served Us Nine Pizzas, Heating My Esophagus." For now, you need only remember eight words, and the best mnemonic is perhaps one you create yourself and it therefore especially memorable. A word of caution about mnemonics as a rule: Keep them as simple as you can, or you may need a mnemonic to remember your mnemonic! Pluto was treated for years as an oddity among planets for a variety of reasons, but its status as a planet was never controversial until other objects reminiscent of Pluto but in no danger of themselves being called planets began to accumulate in the astronomy world. It is smaller than the Moon, yet it has five satellites of its own. The largest, Charon, is almost half the size of Pluto, making the pair more of a double-planet system than a planet- (or dwarf-planet-) moon system. Notably, the orbit of Pluto is so elliptical, or oval-shaped, that it sometimes strays inside Neptune's orbit (this last happened between 1979 and 1999). This meant that when Pluto was a planet, it wasn't always the farthest from the sun, thereby scuttling the normally memorized order on a technicality. When Pluto was downgraded by the International Astronomy Union (IAU) to a dwarf planet in 2006, other objects in the solar system enjoyed an upgrade. Among these was Ceres, the largest of the 750,000 asteroids. Still, although it is believed to account for a third of the mass of the entire asteroid belt, Ceres is 14 times smaller than Pluto. Of the three dwarf planets more distant from Pluto, Haumea is the closest and takes 285 Earth-years to orbit the sun. It is one-fourteenth the size of Earth. Makemake is next, taking 310 Earth-years to revolve around the sun; discovered in 2005, it is nearly as large as Pluto. Finally, Eris, the most distant known dwarf planet, is a staggering three times farther from the sun as Pluto. Also discovered in 2005, its being similar in size to Pluto touched off the beginning of serious debate about Pluto's status as a planet. All other considerations aside, the assigning of a different label to Pluto has simplified the task of remembering the order of the planets, because they now align themselves naturally in symmetrical groups of four – the terrestrials on the inside, and the gas giants on the outside. Space.com: How Fast Does Light Travel? NASA StarChild Question of the Month: Is Pluto or Neptune Farthest From the Sun? Beck, Kevin. "How to Remember the Planets in Order." Sciencing, https://sciencing.com/remember-planets-order-2110264.html. 15 October 2018.